KEY: Bottom numbers indicate how many hurricanes were forecast for each year. Red icons above the line indicate how many more hurricanes occurred than predicted. 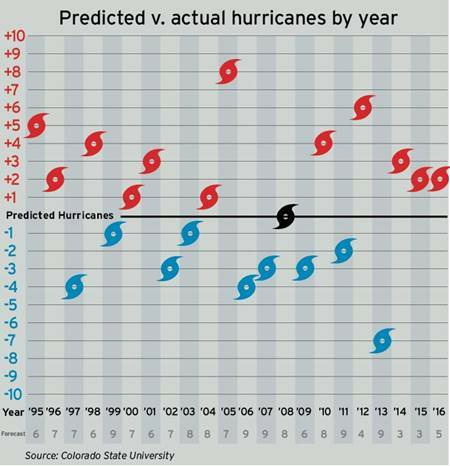 Blue icons below the line indicate how many fewer hurricanes occurred than predicted. According to BoatUS, damage from hurricanes is a leading cause for boat insurance claims. So each summer, the national advocacy, services and safety group anxiously awaits predictions, from a number of highly qualified experts with supercomputers, as to how many tropical storms and hurricanes will form in the Atlantic. With most 2017 storm forecasts now predicting average to above-average storm activity for the 2017 Atlantic Hurricane Season (June 1 – November 30), just how accurate are these predictions, and do boaters need to adjust their hurricane prep plans this year? 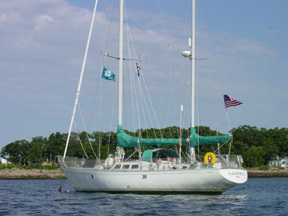 The BoatUS Seaworthy Program, which helps BoatUS members avoid injuries and boat damage by analyzing insurance claims data and publishing its findings in BoatUS Magazine, compared over two decades of storm predictions from one of the better-known hurricane-season forecasts from Colorado State University’s Philip Klotzbach and the late Bill Gray. Said Seaworthy Director Charles Fort, “Our mission was not to judge the forecasters but to find out how much confidence we should have in the hurricane-season predictions and what it means to boaters,” said Fort. After comparing annual predictions to actual weather, Seaworthy discovered that out of 22 years of hurricane season activity forecasts, only one was 100 percent accurate. In some years, there were up to eight more storms than predicted (click here for chart with data). Boaters often misinterpret what the forecasters try to do, says Fort. “Early season hurricane predictions don’t attempt to forecast the percentage of storms that will come ashore or which coastal locations will be in the crosshair.” BoatUS members can get public advisories from the National Hurricane Center as they are issued, as well as detailed maps of the forecast track, wind bands and wind field for each named storm. Free hurricane-planning help is available online at BoatUS.com/hurricanes.